Want it delivered by Saturday, Apr 27? Order in the next 21 hours and 48 minutes and select FedEx Saturday . Or give us a call at 1-800-625-5468. When the power goes out, an APC battery backup with surge protection provides guaranteed power for computers, external hard-drives and other electronics, including your wireless router so you can maintain a network connection for your IoT devices when you need it most! 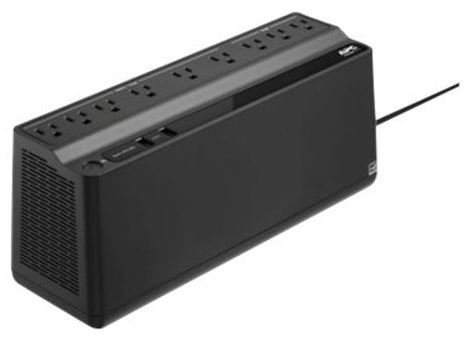 Ideal for full-sized computers and monitors, the Back-UPS BE850M2 offers 450W of power, 9 total outlets, plus two USB Charging ports (2.4A shared). This compact but powerful Back-UPS has many features and benefits that might escape your first glance. Learn more about APC's 850VA Back-UPS. Every connected SmartHome needs a UPS to help keep your wifi on and available, so that your SmartHome stays, well...smart!